Learn how to easily brew great tasting beer. I learned a new brewing word the other day. Which made me immediately say to myself "Release the Krausen!" But enough with the bad jokes, let's talk about what a krausen is. The krausen is the foamy head that constitutes on top of fermenting beer as it sits in the fermenter. A healthy head of krausen is an ideal goal of the home brewer because it's a sign that your beer is fermenting just as it should. Knowing this can be quite handy because if you are not seeing or hearing bubbles escaping from the airlock, the presence of a krausen build up is proof that the yeast is doing its job and fermentation is occurring. And just the same as the presence of krausen shows fermentation is occurring, it's disappearance (but not initial lack of) is an indicator that fermentation is complete (or halted if brewing conditions are too cold). Occasionally brewing conditions mean that the yeast is so active, the krausen behaves like it is a kraken released from the gates of hell and it foams up like a fiery tempest and blows out the airlock, just making a heck of a mess all over your brewing equipment! These beer explosions typically occur with glass carboys which allow pressure to build. A solution to krausen 'blow out' is a using a blowoff tube. One replaces the standard carboy airlock with the tubing. The tubing can then release into a bottle, bucket or whatever to help with reducing any blow off mess. Check out the image to the right for an idea on how to set up the blow off tubing. This example uses a steel tube. If you're not convinced this tubing is worth the effort, consider this. 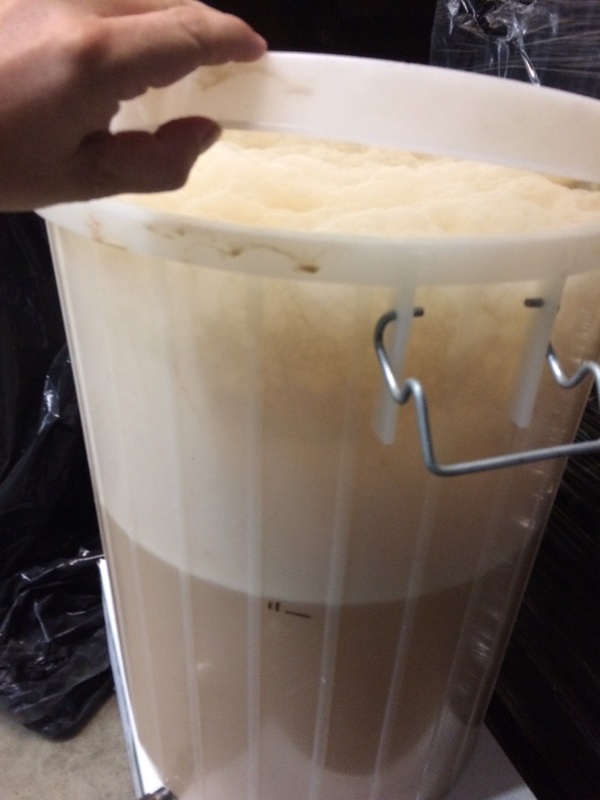 A common krausen issue is that the the airlock can get clogged with foam and any added hops. This leads to a strong pressure buildup in the fermenter which when is it great, the barrel lid, bung or airlock blows off, spewing stuff everywhere and making for a very messy and frustrating cleanup. There's even the potential for damaging your equipment. We suggest if you have brewing conditions where this has happened more than once, you may wish to consider grabbing some tubing from Amazon! Make sure you get a suitable thick pipe, nothing too narrow as that will work against you. We've not done it ourselves but we have read that some punters fill that bottle or bucket the tubing goes into with water so as to further help retard the foaming krausen! Have you ever heard of Fermcap-S? You could also try and prevent too much foam by using an anti foaming agent like Fermcap-S. If you wish to use it in your carboy or fermenter to prevent the krausen from escaping, the dosage is only 2 drops at the start of fermentation. When you have bottled your beer, it's time to get cleaning that fermenter right? And if you've done everything right, there will be a ring around the line where the krausen rose from. I call it the Krausen line. If you don't immediately clean your vessel, it will harden and be a right monster to remove. A good soak with PBW or sodium percarbonate should sort that line of scum out PDQ. ↣ How long can I leave beer in the primary fermenter? ⇒ What is 'beer enhancer' (will it make my beer taste better)? Coopers Lager beer kit review - any good?